Allow myself to repeat myself. It’s nearing Halloween and maybe, the second time will be better than the first? Let’s ruminate a bit on October. Isn’t there something strangely dark and alluring about this month? In nature, we look forward to trees changing colors while the heat from the summer subsides to cool our muggy air. We look forward to these things, knowing full well that they’re signals of something shortly arriving; for nature, it’s mass temporal, cyclical death and the ungodly frigidness of winter. It’s this winter that extinguishes the last bits of unprotected life out there. It seems that this vision of change hastens something innate in us. Could it be to revel in some last bit of color before it all ends? In day to day life, we do it through a communal celebration of Halloween (or other similar Harvest festivals), where we allow ourselves to imagine, or revel, in it with masks, scares, and darker rituals of all sorts. We look forward to these things, or time, unconsciously because of what they’re meant to prepare us for. Maybe sensations or feelings that are always revolving, at various orbits, in our background: you could say its the feelings of death, fright, darkness, and loss. For some reason, no other month so vividly reminds us that we have to find ways to deal with such feelings. This celebration of life through remembrance of the pains one takes to live it, is the perfect reason to pick Comus’ First Utterance as the album of the month. Myself, I’ve yet to hear another album out there that will ever be as truly alluring as this one. Where other “dark” albums find ways to repel (completely missing the point of this type of music), an album like this, finds ways to grab you in its hands and force you to do something: listen. Originally released at a time when hippie ideals were being replaced by mindless debauchery, and at the height of the Vietnam era when rampant conservatism threatened wanton bloodlust, no album release then put the world on notice more of its upcoming decay than this masterpiece of dark folk music. Roger and Glenn (Pre-Comus) / Comus PR. 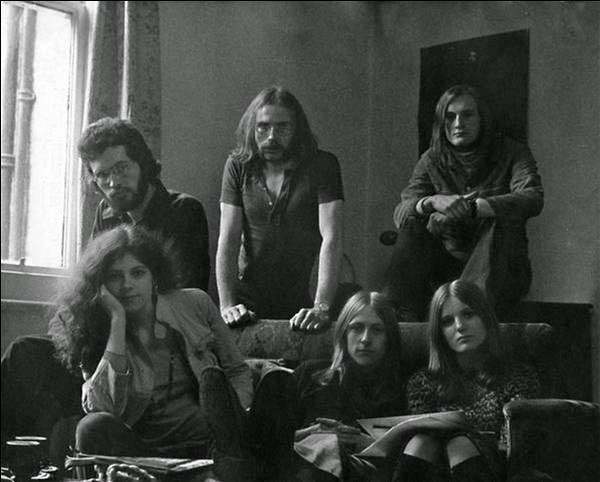 Comus began in 1969 when two art students from Bromley in Kent Roger Wootton and Glenn Goring, a duo influenced by Bert Jansch and John Renbourn, were trying to find ways to stand out amongst their peers. 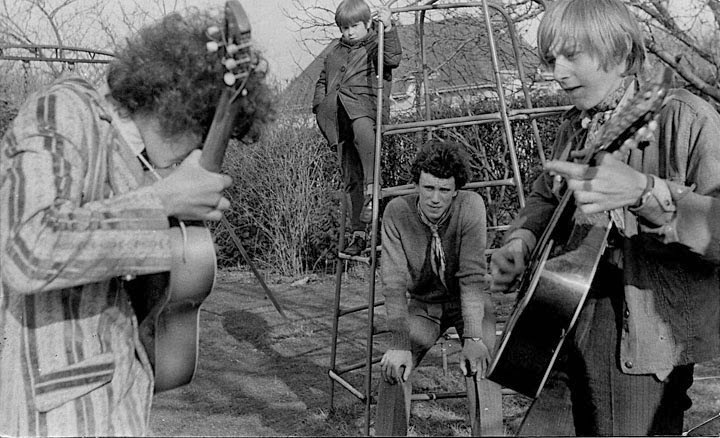 Thoroughly turned off by the facile idealism of hippie culture, and turned on by the darker sounds of artists like Family, The Velvet Underground, Mr. Fox, and the Pentangle, they were finding a third way. These were all artists who were looking at England’s pagan past for something else. 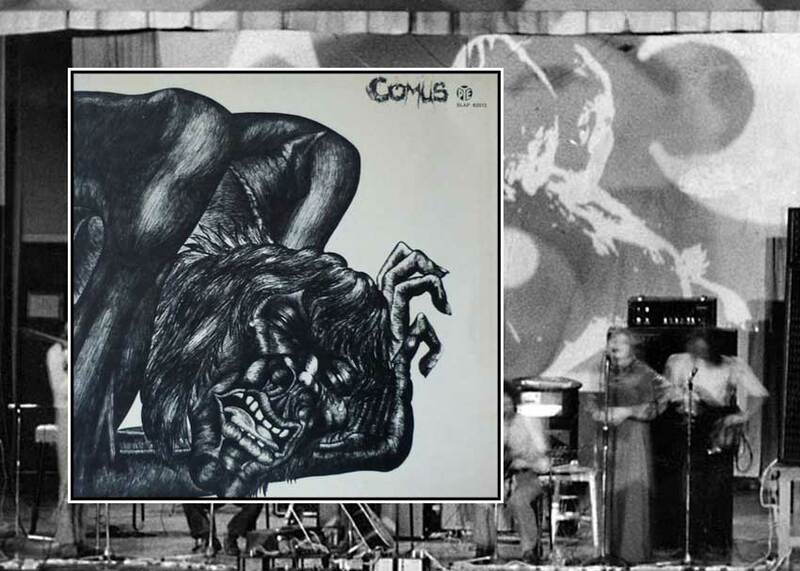 It could have been outre sounds and influences, but for Comus themselves it was a realization that their truly best songs were the darker ones. By some good grace, this duo was given residency by David Bowie at his early folk venue, the Beckenham Arts Lab. It was in this venue where they would slowly build a working band that augmented their own take on folk music. In order to continue playing their they needed to have a proper band name. It was around this time, both of them had been reading up on the whole mythos of Comus, both the Greek story and John Milton’s Comus Masque, its much more contemporary work. The original Greek God of Excess who would use song and dance to get commoners to do things they wouldn’t normally do was interesting, but the Comus from Milton’s work was far more intriguing. This Comus was a necromancer who could use any dead body as a conduit to seduce the living into falling into traps that would sate his carnal pleasures. 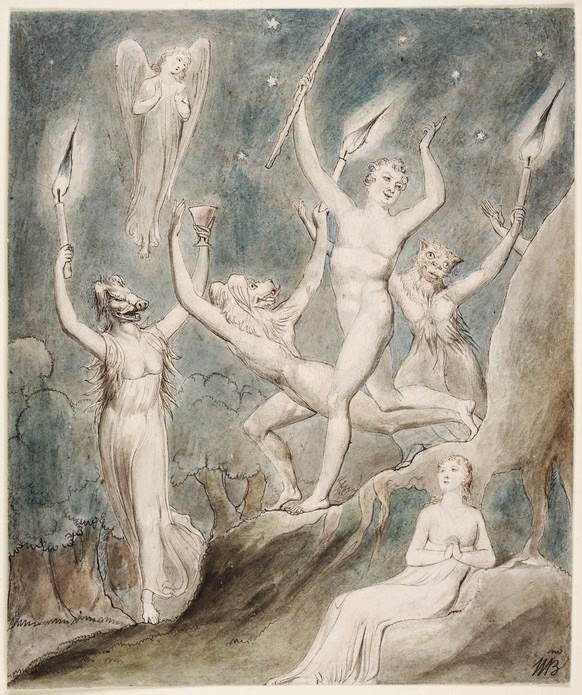 Milton’s story tried to show how even though a young girl fell under the lure of Comus, some innate sense of justice made her refuse his seductive pleasures (wine, herbs, and other temptations) and escape his clutches. A morality play of sorts, masques themselves used to be the real of masked plays or dances that would allow the noble gentry to commune with the common man. Somewhere down the line, as the writers of said plays became more sophisticated (A Midsummer’s Night Dream, anyone…) these same writers were able to use such costumed outings as stages to subvert some kind of norm, and politicize what they weren’t free allowed to poke at. Milton’s Comus tale on the face of it speaks of the virtue of chastity, but it’s symbolism runs much deeper. It was his way of showing how the nobility attempted to get away with their own debauchery (outside of this environ) through any cost measurable and immeasurable. They’d entice you with fool’s gold (whatever that was), all in a quest to get their way. For good reason, Puritans eventually closed down such entertainment. For them, these masques were becoming ways to show a certain darkness in all of us, and to experiment with hidden mores much more openly. That was dangerous. When Donovan said, “won’t you join the dance” it went back centuries to an era where the dance freed you of certain prescribed inhibitions and prohibitions. 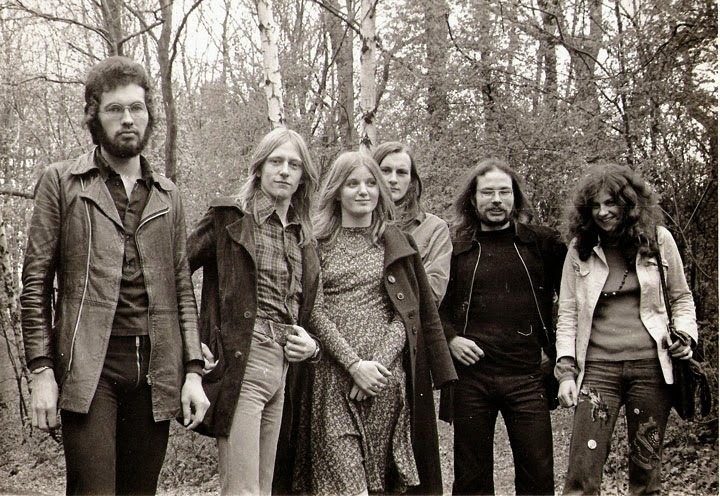 One of the first songs Comus ever wrote was called “The Bite,” a song with two rotating stories. The first touches on canines in the forest tensing up, in shock over someone creeping through their realm at night. The second one is of a Christian escaping from his murderous persecutors into this realm. The two stories converge on something biting. When the persecuted gets caught and hanged, that’s when you know who the real scary demon is…it’s where the focus of the album closes in. Its this song that Comus would use to flesh out the rest of their ideas and imagery, and in essence feed their sound. If they could present horror in various ways, this Comus abstraction could present certain injustices that normally wouldn’t be presented in certain musical ways. 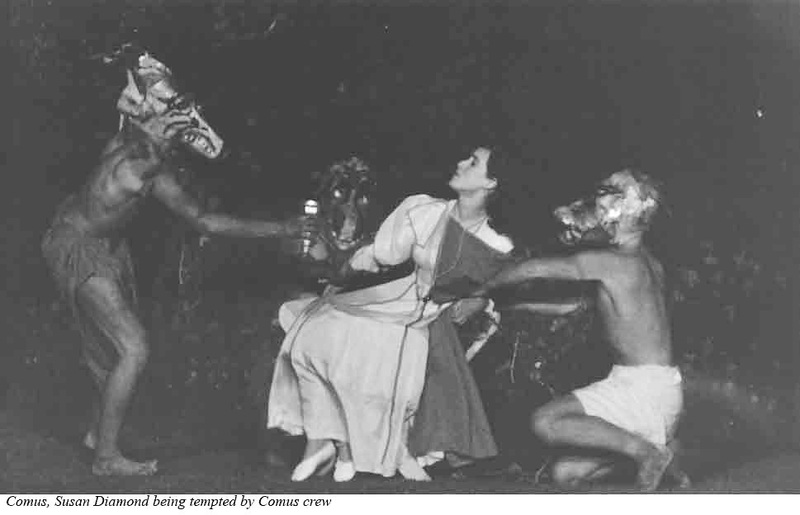 This is the reason this group would own the idea of masking themselves in the Comus creature. By the time of their first and only recording, Roger and Glenn had augmented their duo with four other brilliant musicians. The most important was Bobbie Watson, a young gal with a certain angelic voice, to serve as a foil for Roger’s demented vocal delivery. After her came the rhythmic tandem of Andy Hellaby on bass and Colin Pearson on viola/violin. Rob Young would provide the floating, airy respite of their sound through flute and oboe. Forsaking any kind of rock drumming, except hand drums played by Glenn, this 6-piece became the group that the Dawn record label signed to record their first album. The original sessions, truth be told, weren’t what Roger and Glenn expected. Their producer, Barry Murray, who just came off recording Mungo Jerry’s “In the Summertime”, didn’t know how to exactly produce a group without a drummer, and especially one without short, lighthearted pop songs. Through the wonders of 8-track recording, the group did what they could to salvage a necessary sound they were chasing after. The first thing that strikes you about the album itself, before you even get to the sinister elven vocals of Roger, is its totally creepy album cover. 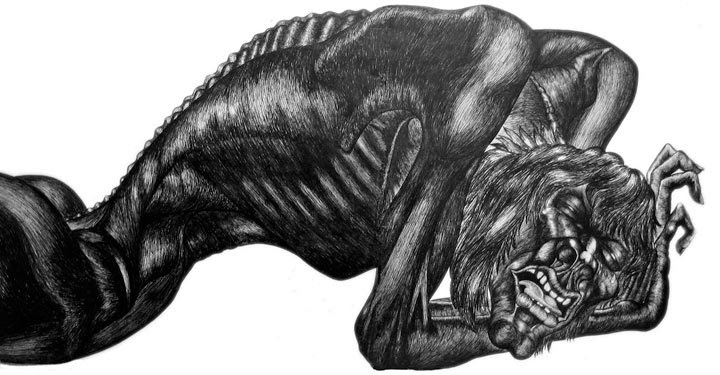 Drawn by Roger himself, using pen only, this artwork attempted to provide a visual representation of a body in primal scream. Buyers of the album, once they could actually muster the courage to open the gatefold, found Glenn’s gorgeous, pastoral watercolor. Little things like this, in a way, were preparing you for what lie ahead. It’s a thesis: underneath the massive dark matter making up your corporal body, there is an important feeling in it that you have to open up to. Now won’t you join its dance? First of all, if you can find a copy of it, forget what the track listing says. Sequence the album with “The Herald” as the opening track. Something about the most merciful, and lovely tune in the whole album slinking you down into the dark bottom of the rest of the album makes that much more sense. The track itself opens with a creeping sweel. Only time has now imparted us this bit of aural history: it all begins with a sliding bass courtesy of Andy. It’s this atmospheric sound which allowed Roger to come up with lyrics. Lyrics which start out nearly, completely wistful, hinting at a dawn that will erase all of the dread that is coming up shortly. It’s one of the reasons, that if you sequence this song at the end, you can see how much of a different feel it would give to the story that will unfold. What you’ll remember most about the song is Bobbie’s heavenly vocals, Roger’s almost animalistic guitar playing, and the ever-increasing dread mucking about from Colin’s viola and the rest of the boys. Somehow, as Bobbie comes back one final time from all the resurgent dread, joined by Roger singing and Glenn on dueling acoustics with Rob joining in on wind instruments, that’s when you feel that this is their aural treatise on the knowing power of hope and perseverance. Perhaps the greatest failure of this album was in it not starting or ending this dark romp with this uplifting Neo-Pagan Sun song. “Drip, Drip” the most rip-roaring song of the whole album, is merciless and pure horror. Told through the viewpoint of the aggressor, it sonically paints a tale of wanton chaos and cruelty. 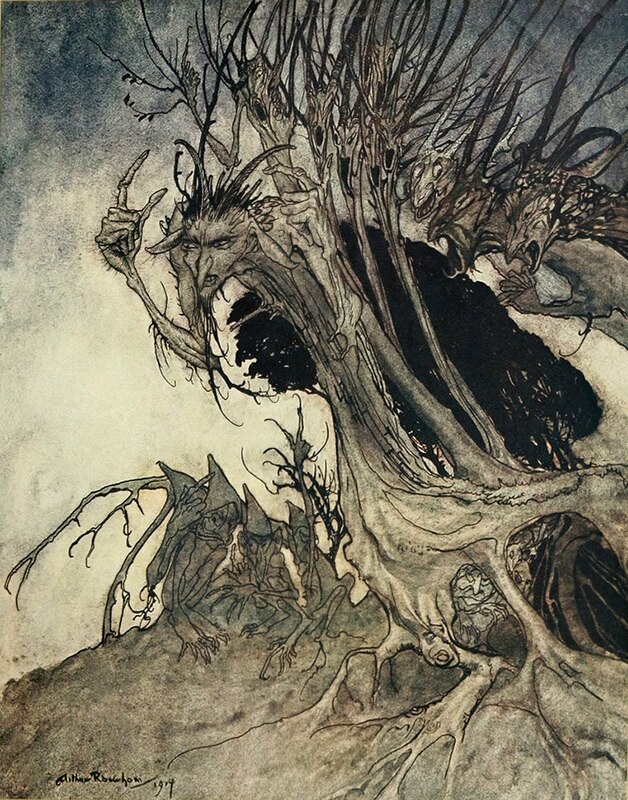 Used as a way to showcase the violin work of Colin, the song cycles through different stages of manic melodies and inhuman sounds only to build up a pagan trance that gets broken up by a terrifying end. When Robert sings about being gentle, it isn’t remotely in the direction of anything humane/human. When he finally ends the song, no “la, la, las” will provide respite from the protagonist’s own inner turmoil. Going back to “The Bite”. You hear a sinister type of Gypsy-inflected music. Robert’s contracting vocals mirroring the dark blues slide work he sneaks everywhere in the song. Viola and flute hurrying the pace, propelling the track toward its swift end. As the dark blues slide reintroduces the escapee captured in jail that’s when you hear the aural scream of pained martyrdom. It’s this moment when you get the gist of the whole song. When “Bitten” begins, this bit of eerie bit of violin and slide bass exploration, it does so in a way to let you ponder the enormity of such preceding death. The final song, “The Prisoner”, is a strident tale about the need to protect the release of all dark thoughts through art, music, etc. rather than bottling in or having someone negate them altogether by force or prohibition. It’s an endorsement of investigating madness, dealing with its roots and causes, rather than sweeping it all away through drugs and conformism. As Roger sings “I can stand prison but even my conscious you hold”, he presents the gist of the whole album. If, everything he sang about before was just a means to release frustration, in some positive way, what’s the point in following demons that are already gone? Sometimes, all you need is to shed light on them to make them go their way. This searching song, which starts off in a melancholy mood, features the last bit of pretty vocal melodies that will be sung by Roger. He does so, in a way, to show the hope treatment holds for many. It’s the real treatments he receives that subsume his hope. It’s that rising melancholia forced through unneeded solutions (pharmaceuticals, lobotomies, shock therapy) all still being practiced then that numbs his spirit. When you hear a primal scream, somewhere around the 4:20 minute mark, its a sign that hope was thwarted by unresisted oppression. This a point the rest of group picks up and uses to fade the whole album out with, at a sonic pace that’s positively chilling. As the album ends abruptly to the tones of “Why can’t you leave me/don’t drive me insane insane insane insane insane…” so ends a truly masterful, thoroughly English, Neo-Folk album that captures the reason a lot of pagan rituals/art have always blended so well into established orthodoxy or religion.